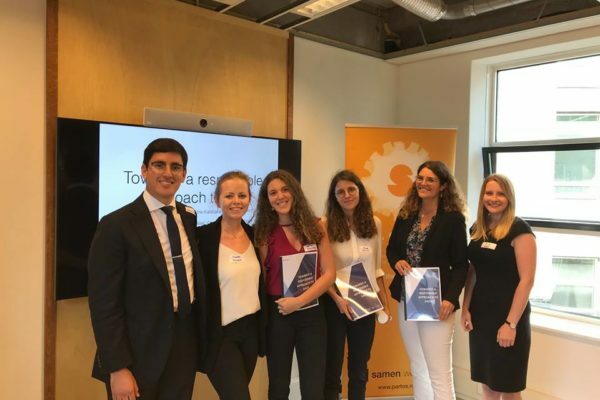 The KGF is proud to announce that on 26 June 2018, as part of a monthly working session organised by The Spindle and Humanity X (Centre for Innovation, Leiden University), one of our IHL Clinic teams presented their report ‘Towards a Responsible Approach to Data’. The team discussed their findings and how the report they prepared for cooperation partner OAM Consult could serve as a platform for organisations to better understand what a responsible approach to data entails. The audience engaged with the team and presented several questions on their findings. The team consists of LL.M. students Marta Albaladejo Carreño, Emily Wood, Charlotte Vercraeye, and Aude Jolliet. The supervision of the report was undertaken by KGF guest researcher Mr. Nicholas Ortiz, LL.M. and Dr. Emma Irving. The IHL Clinic is directed by Dr. Robert Heinsch.